Our friends and neighbors, Jim and Kelly, celebrated their 34th wedding anniversary this summer by traveling back to their original honeymoon destination — The Black Hills of South Dakota. We were delighted that they would take time out of their anniversary trip to send us a postcard — and a fancy one, at that. When it arrived in our post office box, we quickly noticed something different about this one. The postcard featured photos the couple took on their vacation, and the note on back was personalized, but not hand-written. And, there was no stamp. 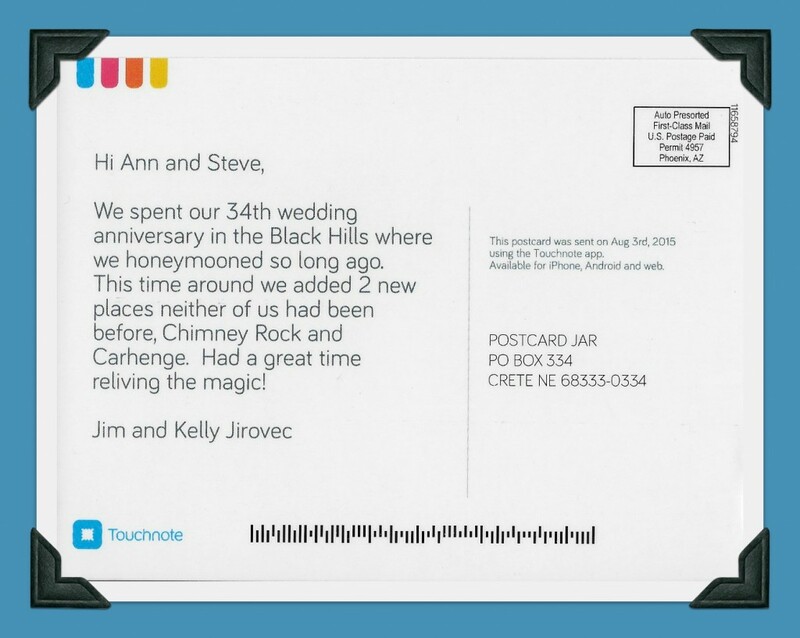 With little closer look (and a phone call from Kelly) I realized they had used a phone app called Touchnote to design and send the postcard. With Touchnote, you just download the app on your mobile phone, upload some pictures, and plug in an address. 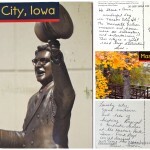 Then, for $1.99, the postcard is mailed to the recipient. That’s it. 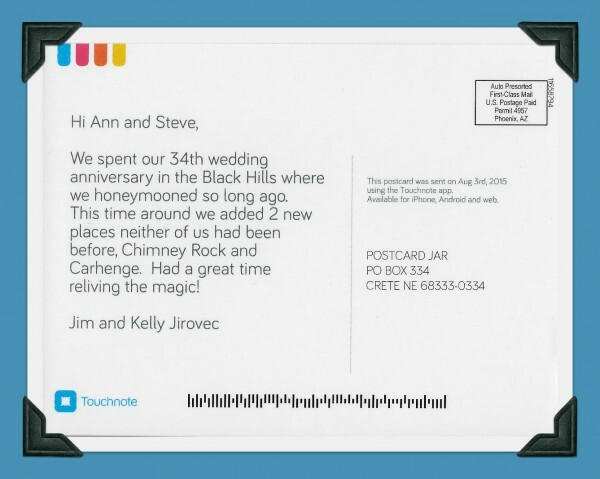 Super easy to use and a great alternative to stopping at a gift shop, looking for a place to buy a stamp, and finding a post office or drop box. It was great to see photos from Jim and Kelly’s return visit to Mount Rushmore and see the the progress of the Crazy Horse Memorial. They even explored two new places they’d never seen in western Nebraska — Chimney Rock and the infamous Carhenge. 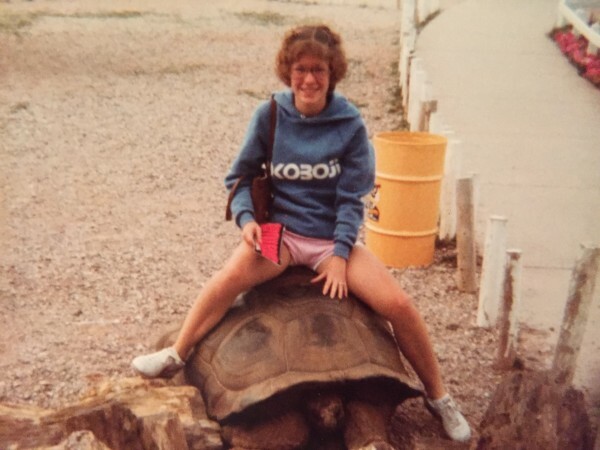 Kelly even shared a couple snapshots from their honeymoon back in 1981 when they visited Reptile Gardens, another Black Hills favorite. 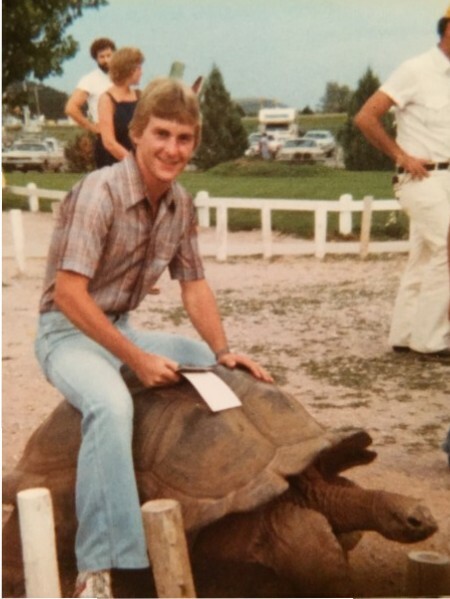 Kelly and Jim on the giant tortoises at Reptile Gardens near Rapid City, South Dakota, in 1981. Thanks again for sending us a postcard, Jim and Kelly, and congratulations on 34 years of marriage. We wish you many more years of great adventures together!